The Working Hunter is representative of the type of horse used in the sport of Fox Hunting, possessing manners, jumping ability, style, pace, and quality. The judge is looking for a horse which would be the most agreeable mount to ‘ride to the hounds’. The Working Hunter must demonstrate his ability to furnish the rider with a smooth and safe ride, clearing all of the obstacles in stride with a minimum of effort and a pace he can maintain during a day in the hunt field. In judging the Working Hunter, a horse will be penalized for refusals, knockdowns, and basic disobediences. The judge may not fault for the rubbing of a rail, unless it is the fault of poor-quality jumping. Penalties may also be assessed for inadequate or unsafe jumping. The Working Hunter courses are designed to offer a reasonable facsimile for the conditions a Working Hunter would meet on a day at the hunt, with natural obstacles and decor. Therefore, it goes without saying, that it is the horse, and not the rider, being judged in the Working Hunter Classes. When you watch a Working Hunter Class, judge the horse for quality jumping, manners, refinement, pace, and turnout—a smooth, comfortable, and visually flawless ride. In today’s Hunt Seat Equitation, it is the rider and not the horse that is being judged. The actions of the horse are important only as they reflect on the horsemanship of the rider. Therefore, it is possible for a rider whose horse ‘acts up’, to be placed among the winners because in the judge’s opinion, the rider met the problem skillfully. Conversely, a seemingly good rider may mean nothing more than a placid horse carrying an unskilled passenger. It is only the rider being judged in Horsemanship Classes whether it is ‘over fences’ or ‘on the flat.’ In Equitation, the judging and scoring is not based on the same process as Working Hunters or Show Jumping. Judges are looking for style of riding, proficiency, accuracy, and judgment in the use of the aids [hands, seat, and legs], an overall impression of complete and quiet control, demonstrating skilled horsemanship. In specifications of Equitation Classes, there is a reference to ‘tests.’ This refers to the tests of Horsemanship established by USEF [United States Equestrian Federation], and is published in the USEF Rule Book. These tests may be applied to the class at the judge’s discretion. Equitation courses are designed to offer the challenge of skill and judgment. 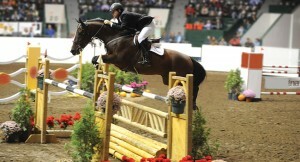 The jumps and courses may be representative of those often seen in Show Jumping. 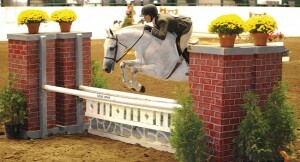 For Equitation, judges reward the form, skill, precision, and handling by the rider. One of the most exciting moments in sports for the spectator to watch is when the jumpers go into action at a horse show. To experience a great horse and rider combination competing over a demanding course is thrilling and impressive. In order to derive the full measure of enjoyment from these events, the spectator needs to understand the basics of keeping score. The jumper is the ‘athlete’ of the show. His task is solely to jump, regardless of style or manner, and his score is based entirely on his performance alone. The scoring for show jumping is based on a point system for ‘faults,’ for example, knocking a rail down, jumping refusals, or exceeding the specified time limit. The winner is the horse and rider who has least number of faults. Hence, time is the key factor in deciding the outcome. Electronic and manual backup timers are used to accurately record time. In the case of a tie after the first round [clean or equal number of faults], jump-offs are conducted over a shortened and usually raised course. Those competitors will compete again, only this time against the clock. Designing jumper courses is a technical art form with no two courses ever alike. A diagram of the course is posted indicating the direction and sequence the course must be taken. The rider has the chance to ‘walk’ the course prior to each event to plan their best course of action. Each jump is numbered and flags are placed to indicate the direction the obstacle is to be taken: the red flag is on the right and the white flag is on the left. In Show Jumping classes, what counts is how faultless and, in the end, ultimately how fast!